When discussing the Currency options facing an independent Scotland an important point is often lost in the fog of debate: the options being discussed are alternative solutions to a problem - a problem caused by independence. By focusing the debate on the "best option" we risk missing the point that we are in fact discussing what is the "least worst" option. To understand the pros & cons of alternative currency options we need to understand the nature of the problem that independence causes. There are many learned articles on the subject and I strongly suggest you visit my "Who can We Trust" section for background reading on the topic. What follows is my best efforts summary. The FCWG also highlight the obvious problem with this option: "a monetary union means that there will be one interest rate and exchange rate for the entire economic union. This requires broad alignment of business cycles (close enough to enable fiscal policy to smooth any divergences) and similar economic structures so that changes to the common monetary policy have similar effects across the monetary union." The FCWG also address the "informal" Currency Option and its downsides: "As an aside, there is the option for Scotland to adopt Sterling through an informal process of ‘sterlingisation’. While this option would retain some of the benefits of a formal monetary union there would also be some additional drawbacks. In this instance, the Scottish Government would have no input into governance of the monetary framework and only limited ability to provide liquidity to the financial sector - this would depend on the resources and reserves of the country. 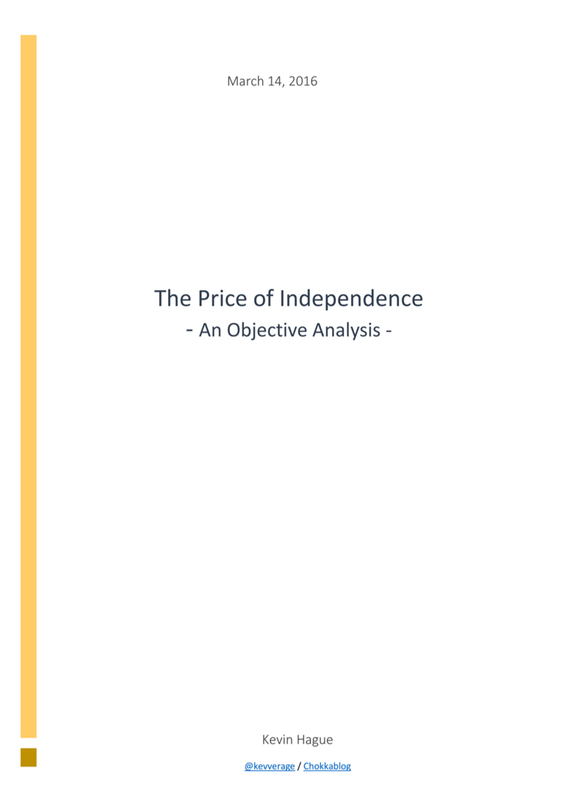 The amount of currency available would depend almost entirely on the strength of the Scottish Balance of Payments position"
To understand the implications of these three points we need to get our heads around the nature of the problem that independence causes; what is changed by independence? A. The Scottish Economy is about about a 10th the size of the rUK. This matters because the central bank is the ultimate provider of liquidity (the "lender of last resort"). The effect of a formal Currency Union would be for the rUK to effectively provide "lender of last resort" capacity to an Independent Scotland ... but the relative scale is such that an iScotland could not provide such support to the rUK. This particular asymmetry is one of the main reasons why all the major rUK political parties have ruled out a formal CU. It's an understandable position. This point is highly relevant given the scale of the financial services and banking sector in Scotland. As highlighted recently by the ratings agency Standard & Poor's: "S&P said it counted the existence of a Scottish central bank, the Scottish government's attitude towards helping struggling banks, changes to financial regulation and independent Scotland's currency among crucial factors that could impact its ratings on the country's banks. It added that its ratings on British banks currently assumed that the UK government would provide extraordinary support to systemically important banks under stress. 'The willingness and ability of the Scottish government to support its banking sector appears challenging,' S&P said, highlighting that the Scottish banking system's assets are currently a high 1,254 percent of Scotland's GDP. This compares with 880 percent for Iceland in 2007, just before its banking system collapsed, the ratings agency said." This is why many expect to see a large-scale movement of banking & financial services firms out of an Independent Scotland to the rUK (where this government support can be guaranteed). As an side this also means a significant chunk of corporation tax that is currently attributed to Scotland's GDP would likely move - but that is for another debate on another day. This relative scale point also explains why any Currency Union would in fact be "de-facto Sterlingisation" and incur the downsides highlighted by the FCWG under point 3. above. This point is argued clearly in the NIESR paper Monetary Union & Fiscal Constraints: "we show that a banking union between two countries of such different size may not be sustainable as there is no incentive to participate. Allowing for cross-border banking and the usual Lender of Last Resort arrangements for foreign banks in the UK, the next best response may be to avoid any special arrangements which could invite the perception of joint bail-out responsibility. Following this argument, a monetary union between two sovereign states of such different size may not warrant fiscal constraints or a banking union. The currency arrangement for an independent Scotland would resemble an informal currency union or ‘dollarization’ using sterling"
This relative scale point is highly relevant to those citing the Euro-zone to argue that Sterling Currency Union could work. Putting aside the question as to whether or not the Euro-zone has in fact worked - and at the risk of stating the obvious - there is no one country that accounts for 90% of the Euro-zone economy. Many of the arguments for an Independent Scotland hinge around us having the ability to take a divergent approach from rUK with respect to public spending, fiscal policies and deficit management. This is starkly illustrated by recent statements from John Swinney that in the first 3 years of independence an independent Scotland would actually be increasing borrowing by billions (£2.4bn in 2018-19 alone). That is hardly consistent with maintaining the "similar economic structures" the FCWG describe under point 2. above. As an aside: I find it strange that the FCWG point to historical evidence of the similarity of the Scottish and rUK economies to provide support for the CU option without apparently addressing these points. They do recognise the differential impact of changing oil prices in the context of "Fiscal Framework Design options" (p.165) but don't appear to mention it in the context of the CU issue. Maybe I missed it. Combining points A and B above increase the "de facto sterlingisation" argument. If (for example) the interest rate requirements of an independent Scotland and rUK are different but there is only one interest rate to set, clearly it will be set for the benefit of the 90% not the 10%. I can hear the screams already: "Who are you to say the Fiscal Commission Working Group - with its two Nobel laureates - is wrong?" Well: what I'm saying is they addressed their brief by identifying what they considered to be Scotland's best currency option under independence. All I'm highlighting is that this can also be described the "least worst" currency option and it has many downsides compared to the current situation - it's a massive downside of independence. The NIESR in their Scotland's Currency Options paper state"In our view, the Treasury and FCWG analyses place too much emphasis on the marginal gains that currency stability may have on trade flows and not enough on avoiding a financial collapse, which cause a far greater loss of welfare. We conclude that a sound case can be made for an independent Scotland having its own currency because it minimises the risk of such negative outcomes"
Blackrock in their Investment & Independence: The Scottish Referendum report state"A currency union with rUK looks infeasible, and would bring risks to both countries. Entrance into the eurozone does not appear to be a near-term option. The best of the (few) choices: Scotland launches its own currency, perhaps linked to the currencies of its main trading partners (sterling would feature prominently) and the price of oil"
In Today's Times (which annoyingly I've just seen after writing this) Sir Martin Jacomb and Sir Andrew Large conclude: "Thirdly, a new Scottish currency could float. This may compromise Scottish independence least and be Mr Salmond’s best option but he doesn’t want it. Given the enormous risks it’s not hard to see why. Speculators and lenders to Scotland would be looking for any weakness." Maybe the SNP realise that launching our own currency or joining the Euro are the only workable long-term solutions ... but they choose not to share that with the Scottish electorate because they know that would be a vote loser? Surely they wouldn't be that cynical? I doubt that the electorate of rUK will see ceding sovereignty to a country that is just a 10th of its size, and that has just turned its back on it, as “no disadvantage”. This is, simply, illogical, because “the English”, if they were to want to enter into a currency union with anyone, would do so with the eurozone or the USA, with whom they have significantly more trade with than Scotland (it’s something like 40/20/10% respectively). So, on the basis of this naïve, quixotic nonsense, I wouldn’t have any qualms about challenging the FCWG and its Nobel Laureates. You do realise that not only was Sir James defending the work of his Commission, but that his remarks are from before the rUK parties ruled CU out and published their reasons? Great piece of work Kevin. I'd suggest that an alternative way of looking at this, as the other comments have picked up is to view the CU from the position of cUK rather than Scotland which we inevitably do. For a start Carney’s comments take on a whole new light for cUK. Here he is clearly saying that a CU will require a sharing and loss of sovereignty. Now many in Scotland say “so what it will be better than we have just now so it’s not a problem”. Fair enough perhaps. Now look at it from a cUK position. You have just been belittled and left smaller in the world by part of your country and it now turns out that your politicians are not only going to let them continue to use the currency they are incredibly going to let them have a formal say over cUK monetary policy. Let’s go look at it another way. As already confirmed by Moodys if a CU was established it would be the ONLY credit negative option for cUK, all other options such as a Scottish currency or Euro entry would be credit neutral. Therefore straight off the bat agreeing to a CU would mean higher than necessary interest rates for cUK. Once again to have any credibility someone would have to explain why cUK would possibly want to incur unnecessarily higher interest rates to help out an independent Scotland? The benefits of a CU to cUK are shockingly small. The net balance of payments effect is small on cUK once you factor in how much an independent Scotland will be importing from cUK and transaction costs are but a minor inconvenience as a wise politician used to passionately argue… once Alex Salmond! The point for cUK is that there is a far better option on the table for them that they can get by simply refusing a CU and that’s a currency peg. Transaction costs will be all but eliminated and the peg administered by the Scottish Government will involve them holding significant reserves of cUK Sterling which will help to keep the £ high and put downward pressure on cUK interest rates. So cUK get’s all the benefits and the costs and risks lie with the Scottish Government. Why then in God’s name would they suffer a CU when there is a delightful option staring them in the face. When you look at it from a cUK perspective you have to wonder why any right minded individual would think they would agree to it? (i)Principal CU benefits to rUK as stated by SNP = £500m (£0.5billion) in saved cross border transaction costs to rUK businesses. (ii) This is the upside for rUK in exchange for underwriting the Scottish Banking Sector, the fiscal discipline of a foreign country's sovereign Government and protecting the Scottish economy from external shocks (e.g. falling oil price). (iii) 2012-3 Scottish Deficit (best case) £12.1billion. (iv) rUK GDP 2012-13 extrapolated from Scottish Govt GERS figures = £1,430billion. slightly less than what Man City and Man Utd pay their players. There won't be a Currency Union will there? Surely a currency union would prevent Scotland from joining the EU because Sterling is no longer in the ERM? Maybe SNP do plan to launch their own currency, but are necessarily keeping the plans secret? South Sudan did this prior to secession from Sudan (can't find a link, but recall stories at the time that De La Rue had secretly printed banknotes for them in HongKong some time prior to actual secession). Roger Bootle's (Wolfson Prize-winning) essay 'Leaving the euro: a practical guide' goes into more detail about why preparing to leave a currency kind of has to be done in secret (http://bit.ly/1CSbsBj). If I had lots of money in a Scottish bank, I'd seriously consider taking it out and putting it in a provincial English building society (or buying US dollars or Euros) a few days before the referendum, just in case I found myself with lots of "New Scottish Pounds" the next day. The pulling money out of banks is already happening. Banner on Natwest site and on RBS. Now can't get any contact via RBS site because of massive demand. If YES wins on Thursday this will be a tiny taster of what will happen.